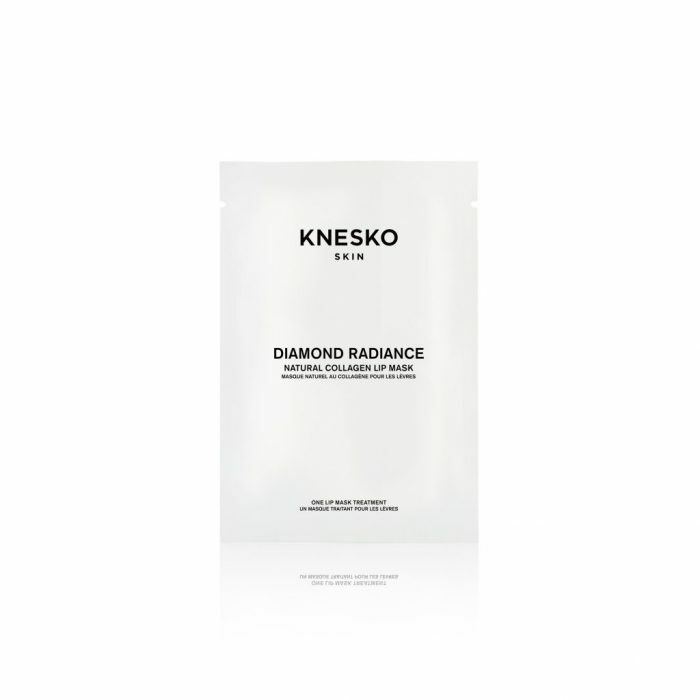 KNESKO’s Diamond Radiance Collagen Lip Mask features our advanced GEMCLINICAL™ technology to nourish and repair your lips. Our single treatment packs are filled with diamond microparticles that gently exfoliate for age-defying volume, and polypeptides that target cells well beneath the surface of the skin to achieve peak hydration. Brightening and smoothing, our doctor-formulated, cruelty-free mask helps to soften your lips and combat nearby age spots. Our lip mask is specially designed to be oversized, allowing the rejuvenating power of the diamond microspheres to penetrate the areas around your lips – including the upper lip beneath the nose and a portion of the chin – where age spots and pigmentation can be a problem. 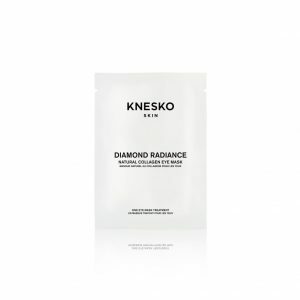 Relax your mind, rebalance your spirit, and rejuvenate your skin with KNESKO’S revolutionary technology, built upon the principle of harmonizing ancient spiritual wisdom with modern scientific advancements. Our Diamond Collection collagen lip mask brims with luminescent diamond powder, long-associated with powerful spiritual properties, such as creativity, confidence and alignment with the higher self. Diamonds are gems that promote positive energy by super-charging your Crown Chakra, connecting you to a broader perspective and transcendent consciousness. Take a moment of quiet out of your busy life and give yourself the gift of masking. Apply our soothing and rejuvenating diamond lip mask to not only plump and brighten your lip area, but also to revive your spirit. The diamond powder, marine collagen, rose essential oil and other nutrients will be absorbed deeply into your skin, all the while releasing active ingredients that help to combat dryness, fine lines and discoloration. Discover the wonder of GEMCLINICAL™ technology by sampling a single treatment Diamond Lip Mask, a truly singular sensation. More than simple skincare, our Diamond Radiance Collagen Lip Mask elevates your mind, body and spirit with the power of nature’s purifying elements in a convenient single treatment pack. Developed under a team of doctors, the Diamond Radiance Collagen Mask Collection uses GEMCLINICAL® technology which blends the special properties of precious minerals and gemstones with proprietary skincare formulas packed with active and clean ingredients. Thus allowing for superb anti-aging skin care results. Apply hydrogel pads to the Lip area. Gently push down on the mask to smooth out air bubbles and increase suction. Take deep, relaxing breaths and repeat your affirmation in a quiet, mindful meditation: I am connected. Developed under a team of doctors, the Diamond Radiance Collagen Mask Collection uses Polypeptide Technology and Diamond Powder, which are designed for maximum absorption and delivery of nutrients into the skin. Thus allowing for superb anti-aging skin care results.